The following chart compares the distributions of winners for the baseline momentum strategy (6-1) that each month picks the ETF with the highest lagged six-month return and the optimal variation (5-1) based on picking each month the ETF with the highest lagged five-month return. 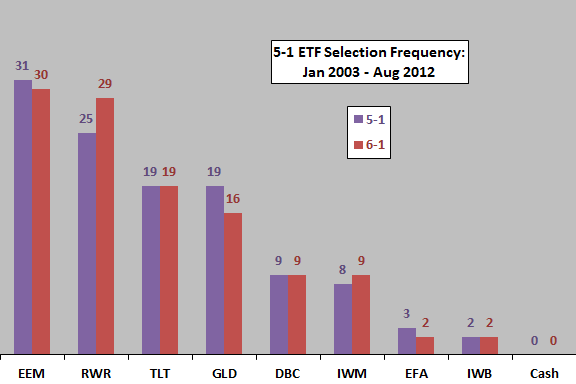 The most noticeable differences are that the five-month ranking interval specified RWR fewer times and GLD more times. How does these differences translate into cumulative return? The next chart compares the net cumulative returns for the 5-1 and 6-1 strategy variations with trading friction set at 0.25% per ETF switch. Results suggest that the outperformance of the 5-1 variation concentrates during the financial crisis and immediate recovery. A possible explanation is that asset price trends compress around crises (in which case the mix of bull and bear market states affects the optimal momentum ranking interval). 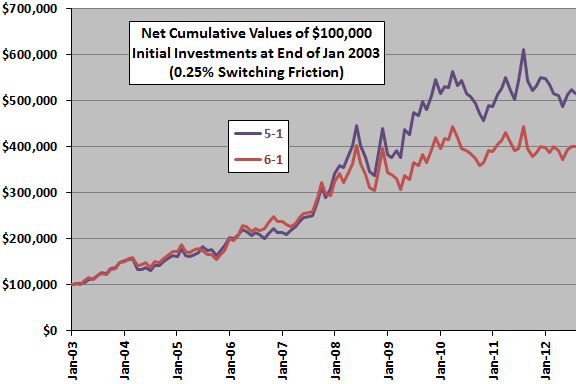 Average net monthly return for the 5-1 (6-1) strategy variation is 1.63% (1.39%), with standard deviation 5.93% (5.92%). How do the monthly return streams differ? 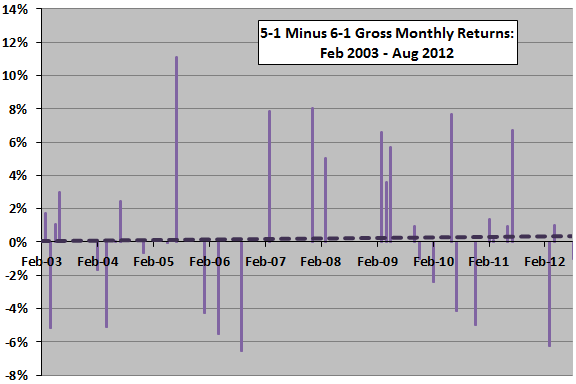 The final chart shows the month-by-month difference in gross returns between the 5-1 and 6-1 strategy variations. The heavy dashed line is the linear best-fit trend in differences, suggesting a weakly increasing difference over time. However, data are sparse for trend measurement. In summary, evidence from simple tests suggests that a five-month momentum ranking interval may outperform the baseline six-month interval as applied to the selected set of asset class ETFs using available data. We have therefore changed the model Momentum Strategy by replacing the six-month ranking interval with a five-month interval. As noted, optimizing introduces data snooping bias, such that the best alternative overstates future performance (but likely preserves the ranking of alternatives). Given the modest number of monthly differences and the volatility of those differences, confidence that the 5-1 and 6-1 strategies will continue to produce different outcomes is not high.